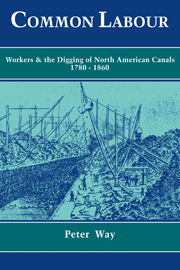 This study of canal construction workers between 1780-1860 challenges labor history's focus on skilled craftsmen. Canalers were unskilled workers, often members of despised social groups such as Irish immigrants and African-American slaves. They worked twelve or more hours a day in all weather, exposed to diseases and job-related risks, going home at night to rude shanty towns. Their harsh lifestyles bred conflict that undercut worker unity but promoted battles with employers over workplace issues, and the state was increasingly drawn in to enforce industrial production. Lacking the power that skill brought, canalers had little control over their working conditions. Their experiences represent a different strand of the labor story. Introduction; 1. Early canals 1780–1812; 2. 'As low as labour and capital can afford': the contracting system 1817–1840; 3. 'Human labour, physical and intelligent'; 4. Payment 'fit for labouring people'; 5. 'The greatest quantity of labour'; 6. 'Canawlers and citizens'; 7. 'Guerilla war': labour conflict in the 1830s; 8. 'This new order of things': the 1840s–1850s; Conclusion; Appendices; Index.